"A chunky, crisp summer appetizer that has been a real hit at our barbeques!!!" 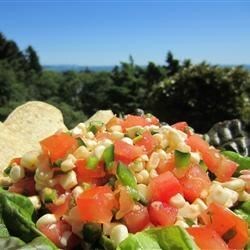 In a large bowl, mix together corn kernels, tomatoes, hot yellow banana pepper, garlic, green bell pepper, basil, sage, thyme, lemon juice and olive oil. Cover and chill in the refrigerator at least 1 hour before serving. The salsa was ok... wasn't really special and if you are looking for a traditional salsa this is not it. I would say the effort in preparing is not worth the product.